This page is meant to help canoers and kayakers find the perfect length paddle. Use this as a guide to help get started, but remember the best way to find the best paddle for you is to try it on the water. The are many variables to take in to account. Give us a call and we will give you the benefit of over 40 years of paddling experience to help find the paddle of your dreams. One of the questions we are asked most frequently, is how to size a canoe paddle or kayak paddle. The best way is to get in your canoe or kayak and try a few different lengths and see how it feels. However that isn't always possible, so we have come up with the video above that along with the canoe paddle and kayak paddle sizing chart below that will get you close. Use this with a grain of salt because there are always exceptions to the rule. If you are going to error, I would suggest going shorter instead of longer, your shoulders will thank you later. Seated on a hard surface, measure from the seat of the chair to your browline. Why measure seated??? Chances are you will be paddling sitting down and your torso length is what is important, not your height standing. 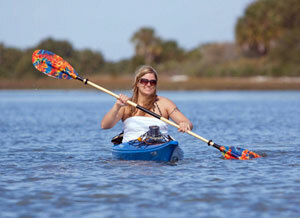 The most common length for recreational kayaking is a 230cm for an average height person with an averaged sized kayak. Your torso and arm length, shoulder width, and kayak width will help you decide to go longer or shorter with paddle length. Also your paddling style will have an influence on choosing a paddle length. I have found that if you are a high angle kayak paddler and are looking for more performance, a slightly shorter paddle (5-10cm) will work better. Also using a 5-10cm shorter bent shaft kayak paddle is more comfortable. If you are looking for a double bladed paddle to use with a solo canoe, we would suggest a 250 to 270cm paddle. The longer paddles keep you drier but....remember a longer paddle gives more leverage, is heavier, more difficult to control and will require more strength (tire you quicker). This rule applies to all types of paddles. As I said above the best way to choose a paddle is to get out and try a few paddles and find what feels best to you..